I discovered Despana by accident, looking for something else, in the disorienting cross streets where Little Italy becomes Soho. A small gourmet shop and wholesaler specializing in Spanish imports, it’s lined on one side with olive oils, jars of preserves, canned delicacies and Valor hot chocolate and cases of cheese and cured meats on the other. There’s also a small lunch counter offering pintxos, tortillas, bocadillos, salads and desserts. Basically, everything you worried you’d never find when your year abroad ended. Now that I have found it, I plan to seek it with purpose, again and again and again. Really loving the blog! Great stories and recipes!!!! 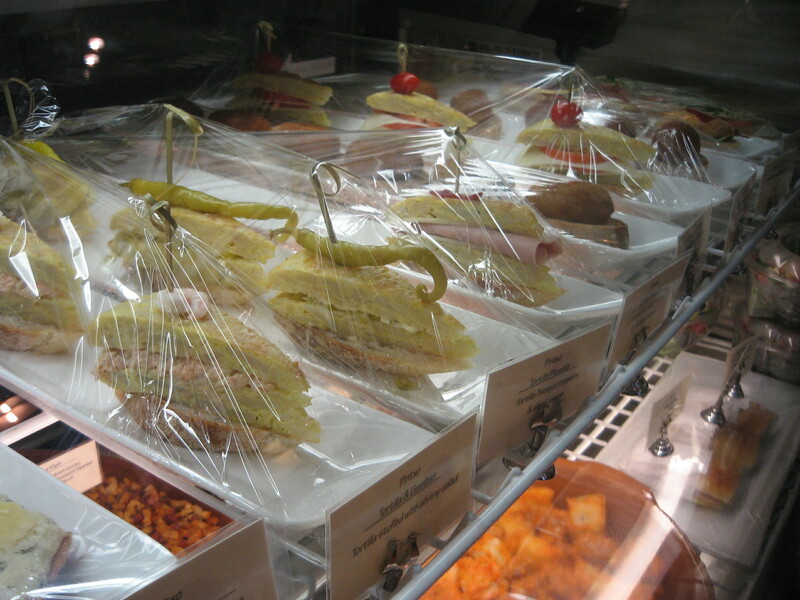 Love the picture too…the sandwiches look like an armada. i love despana! last year, i got to sample through all of their different chorizo… probably as close to heaven as i’ll ever get.